Briana Donis is fascinated by the body. As a junior Applied Movement Science major at the University of Texas at Austin (UT), Briana takes classes like “Theory of Human Performance” and “Applied Biomechanics of Human Movement.” She conditions her body through weightlifting and healthy eating. While these may simply sound like the choices an active and energetic young woman, for Briana, her interests and pursuits stem from a deeper place. Not so long ago, Briana's body seemed to wage war against her. It all started during the spring semester of Briana’s senior year of high school. Life was good. Briana’s classmates at Mayde Creek High School had recently voted her homecoming queen. She had earned high enough grades to secure a place in the top 5% of her graduating class. 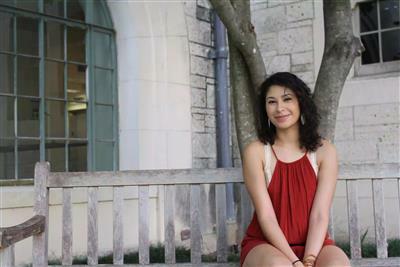 The University of Texas, her dream school, waited for her just on the other side of summer. Briana found her plans cruelly interrupted by the aggressive bone marrow disease. Immunosuppressent therapy, chemotherapy, radiation, blood and platelet transfusions, and a bone marrow transplant all failed in healing her. No matter what doctors tried, Briana found herself still critically ill, still spending her days and nights in a hospital room rather than classrooms and dormitories. In spite of her frightening, disheartening circumstances, Briana looked for glimpses of light, and become a beacon of hope in the bone marrow transplant unit herself. Briana wore her UT gear and did yoga poses with her IV pole standing watch. She wrote “bald is beautiful” on her hairless head and posted photos sharing the artistic declaration. And when His Grace Foundation’s Executive Director, Val Anderson, walked through the doors of her hospital room, Briana welcomed her with a sigh of relief. So many organizations that had helped other patients and families Briana had met in the hospital weren’t able to serve her. Despite the course of treatment being near-identical, Briana didn’t have cancer. For many organizations, that missing piece of criteria meant Briana and other patients like her went without the comfort and care that others received during their hospital stays. Briana says that the experience of extreme illness and sometimes feeling unseen by organizations serving patients with cancer led her to develop patience, kindness, and deeper understanding. Support from His Grace Foundation encouraged Briana on her journey toward all types of wellness--physical, emotional, mental, relational. She received her weekly shopping trips with sparkling joy and gratitude, gushing over the Fruit Roll-Ups and Fruity Pebbles delivered to her room. She treasured every night spent sleeping in the apartment HGF provided for her and her mom to stay in after her transplant. And after her second transplant, which was successful, she began to promote HGF by attending events and encouraging everyone she knows to benefit HGF when shopping on Amazon. A bright ray of hope, Briana wants to help others find the light when life goes dark.